Another New Year’s — with its fireworks, ball drop, and resolutions — has come and gone. You probably still have all the photos from the midnight revelries, but if you’re wondering what happened to all the resolutions, you’re not alone. A vacation to New York may not seem like the best time to get into that workout routine you promised yourself, but vacations can actually present some of the best opportunities to learn new things about you body, your goals, and yourself. If that sounds good to you, you picked the right hotel. 48LEX is offering an exclusive new lifestyle package, called New Year, New You, where our lifestyle experts share some new tricks for living your best life — and help you stick the landing. Here’s a rundown of three smart strategies for meeting all your health and wellness goals, as well as the 48LEX experience to kick ‘em off. If you’ve ever tried a workout regiment before, you probably have a pretty good idea of what doesn’t work: endless crunches while you watch TV, running around in circles on a track, or anything involving a VHS. If you want to give yourself a better shot of success, you just might have to try something bigger and bolder than you’ve ever tried before. That’s why 48LEX will give you two day passes to Brick Fitness, where you can try out the high-intensity CrossFit workout program. Additional classes like yoga and endurance running ensure you’ll find something to get your workout regiment off to a strong start. Give your body what it needs. Working out, getting fit, and staying healthy often feel like a nonstop job. It’s easy to forget the reason you probably started this whole workout regiment in the first place: to make yourself feel good! Getting the nutrition and pleasure you need to keep going is a crucial part of any workout — or any goal at all. 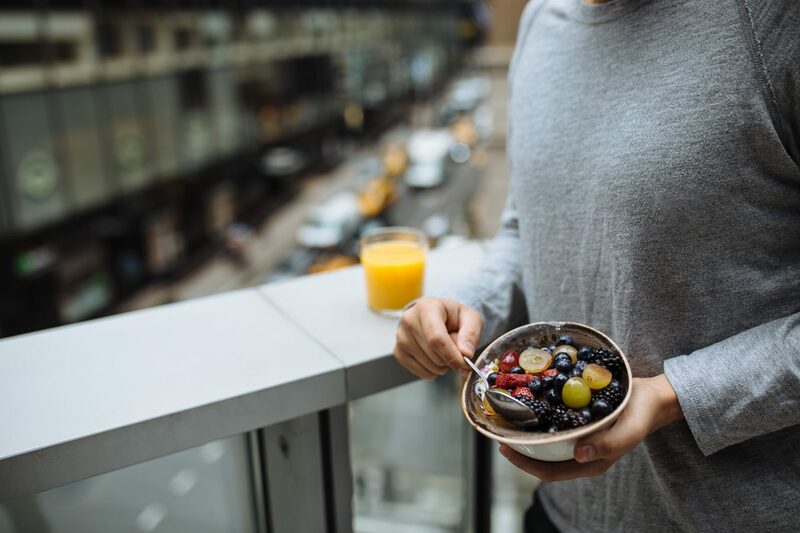 That’s why 48LEX is offering guests with the New Year, New You package two complimentary glasses of fresh-pressed juice straight from our restaurant, Lexington Brass. If a tall glass of juice isn’t the first thing that comes to mind when you think healthy and delicious, then you haven’t been keeping up. Try some of the creative, delicious and nutrient-packed flavors on us, and soon you’ll be pressing juices and taking names. A final pitfall of workout regimens is burnout. We’re often told to make a plan and commit unwaveringly to it, but if we don’t pause and check in with our bodies during this process, we’ll eventually find ourselves lost, exhausted, and more than a bit frustrated. That’s what makes yoga such a valuable addition to any fitness routine. Combining a rigorous exploration of your body with a demanding amount of self-reflection, yoga will keep you in communication with your body and mind, ensuring you stay true to your intentions and capabilities. Stay with 48LEX over the weekend and your New Year, New You package will include a Saturday morning Vinyasa yoga class, linking breath and movement to stimulate deep reflection and real growth.